For the past several years I have seen many people choose a word for the year. This word provides focus and remains with you throughout the year. Instead of a resolution – which let’s face it – most of us break rather quickly – it’s a way to make yourself a better person without limiting yourself to one thing. I’ve been giving this a lot of thought over the past few weeks knowing that the New Year was approaching. I thought of several words and their meanings and ways to apply them to my daily life, but the one word that I kept coming back to was “peace.” I’ve noticed a decrease of peace in my life and in increase in stress lately. I’ve been thinking of ways to implement my word over the next 12 months and I’ve come up with a short list. The list may seem little, but the ideas behind it are BIG! 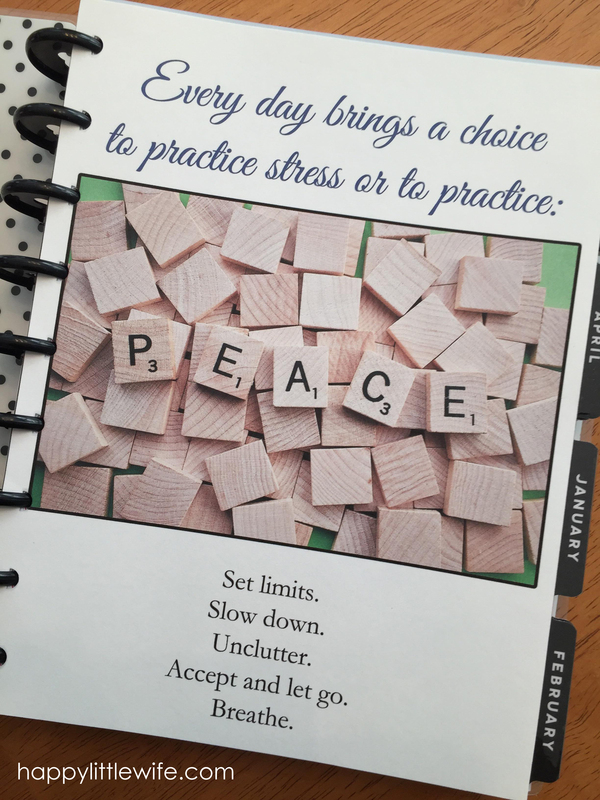 To start, I’ve chosen a quote to keep in mind: “Every day brings a choice to practice stress or to practice peace.” This is absolutely perfect for me because it’s just what I want. Seems simple, right?! I hope so! My bigger thoughts or “goals” for each of those things goes much deeper… and here’s what I’m thinking. Set limits. This means a few things to me, in no particular order. I have a tendency to take on more than I can handle at times because I don’t like to say, “no.” This almost always causes me stress because I never want to disappoint anyone, but I need to learn to set limits and know when I’ve reached my limit. For me, it also means setting more limits with my kids – again, not wanting to disappoint, but knowing when they’ve had enough screen time, snacks, etc. It sounds silly, but I’m always involved in taking care of devices and fixing food and this often stresses me because every time I start to do something that needs to be done, I’m interrupted and by the time I’m finished with the kids it doesn’t seem like I ever get to finish what I started. And lastly, setting a limit for social media. I know I’m not the only one who can get sucked into mindless scrolling or pinning! Slow down. If I can’t get it all done in one day, it’s okay. Taking time to just stop and enjoy little moments. Unclutter. Clutter and kids just seem to go together! So I’m not talking about the mounds of toys and games, but little things like letting the mail pile up because I don’t feel like dealing with it. That’s a big one for me. I truly despise the mail. I should really just put a trash can next to the mailbox and deal with it before it even makes it in the front door. (Hmmm… That’s not such a bad idea.) And then there’s the pantry. And my desk. Oh, my desk. The clutter of those things can really work my nerves, but hopefully I can tackle those things one day at a time and keep them clutter free. Accept and let go. Easier said than done, I’m sure. But this one I really need to work on. I can get so worked up over situations and circumstances I cannot control. I let these things consume my brain. Sadly, I often find that I’m the only one upset, while the person (or people) who have upset me move on, and quite frankly, could care less and I’m the only one who ends up feeling sad, hurt, or stressed. I need to practice accepting these things I cannot change and move on. In order to keep my Word of the Year close, I’ve created a special page that I inserted at the very beginning of my Happy Planner. I can leave it right in the front or I can move it to the beginning of each new month. Do you have a word for the year? If so, what is it? I’d love to hear them!